(Bloomberg) -- The military conflict in Libya is fueling a new war of words among Italy’s leaders, deepening tension inside the populist government amid risks of an escalating humanitarian crisis. Matteo Salvini, deputy prime minister and leader of the coalition member League party, is insisting that Italian ports will remain closed to refugees crossing the Mediterranean even if the Libyan conflict worsens. That puts him at odds with Five Star Movement leader Luigi Di Maio as well as Prime Minister Giuseppe Conte, who want more flexibility for the country’s response. At least 6,000 refugees are set to embark for Italy, among them women and children, Corriere della Sera newspaper reported on Sunday, citing an intelligence report delivered to the prime minister. The Libyan National Army led by General Khalifa Haftar is fighting for control of Tripoli, where the United Nations-recognized government sits, as separate power centers in the east and west of the country struggle for influence. The conflict is likely to create a new wave of refugees seeking shelter in Europe, with Italy being one of the favored destinations. His appeal had little effect on Salvini, who said less than a day later that he wouldn’t consider reversing his decision to close the ports, no matter how much deeper the crisis gets. Di Maio quickly weighed in, saying such a decision is not Salvini’s to make. Salvini’s tough anti-immigration stance has been a key to his rise to become Italy’s most popular politician. The League leader has insisted that he expects the coalition government to see out its full term despite repeated public clashes over issues ranging from tax cuts to infrastructure projects. Coalition infighting has intensified as the parties prepare to contest European Parliament elections in May. Salvini has also been exchanging public barbs with Rome Mayor Virginia Raggi, one of Five Stars’ most high-profile leaders, Il Messaggero reported. Di Maio said the decision on refugees lies with the Prime Minister and the ministries of foreign affairs and defense, and not with Salvini’s interior ministry. 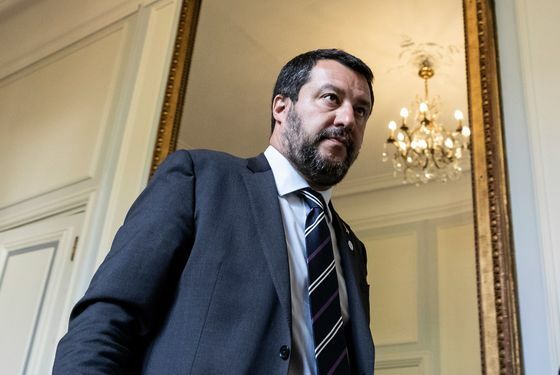 Salvini has also clashed with other political elites over his comments criticizing France for what he says is support for Haftar against the recognized government of Prime Minister Fayez al-Sarraj.